Sure, there is room for the certified pre-owned segment to continue climbing, but it may take some maneuvering when it comes to consumer education. In a conversation with Auto Remarketing at the recent NADA Convention & Expo, AutoTrader.com president Jared Rowe said much of this segment’s potential comes down to educating the consumer on just what CPO is all about. Additionally, he said, the salesperson has to introduce CPO, so to speak, at the appropriate point of the shopping process. The real growth opportunity for certified, Rowe says, is to share the benefits of CPO to consumers as they’re searching around to find their ideal vehicle. That notion is backed up by what AutoTrader found in its 2014 CPO Study, where it emphasized that more shoppers would consider going certified if they were taught more about CPO and its benefits. Prior to being exposed to the definition of CPO, 59 percent of new-car shoppers would consider buying certified, AutoTrader’s study found. Once they’re taught what CPO means, consideration jumps up to 84 percent. Among used-car shoppers, those levels jump from 50 percent to 69 percent. CPO awareness and education is one of the key points behind some of the efforts at CarStory, which recently partnered with Volkswagen of America to offer reports to VW’s national dealer body that can educate VW customers and make purchase decision-making smoother. These CarStory Market Reports introduce VW’s WorldAuto CPO vehicles to potential customers earlier on in the car-shopping process. And by sharing analytics that showcase “each vehicle’s unique story,” these reports can help foster great consumer confidence. And beyond that, it helps address what Bockius called the top concern of selling CPO. “We know that when it comes to selling CPO, peace-of-mind is the No. 1 thing, and that is driven by the warranty. And in talking to dealers that are successful at CPO, they all said the same thing: The way you sell CPO is to compare it to a non-CPO,” he said. Addressing the peace-of-mind element is something that Dale Pollak, founder of vAuto and executive vice president at Cox Automotive, believes will help push CPO. “CPO is strong. 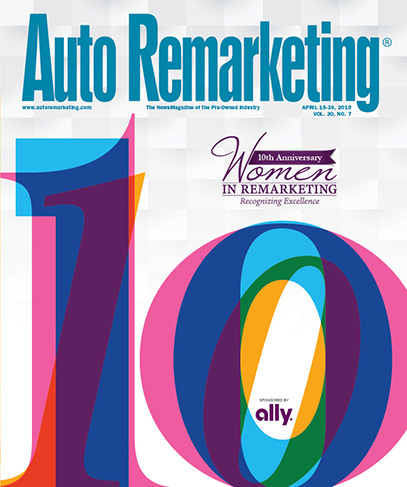 I believe in CPO, and I think CPO will continue to get stronger,” Pollak told Auto Remarketing at NADA. “The reason being — like this is a big surprise, ready for this? — every buyer of a used car has a fear of getting a bad car.